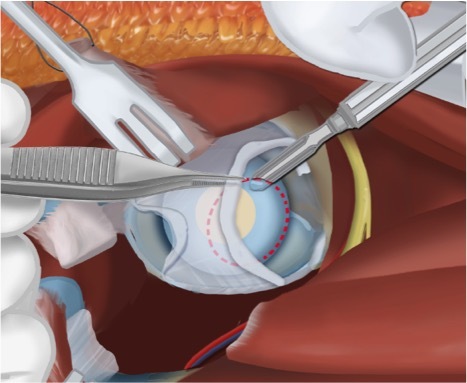 The SUPERhip 2 is a more complicated version of the SUPERhip procedure (SUPER is an acronym for Systematic Utilitarian Procedure for Extremity Reconstruction). It was developed by Dr. Paley in 2001 to correct Type 2A CFD. In the SUPERhip 2, the upper part of the femur is reconstructed into a femoral neck. 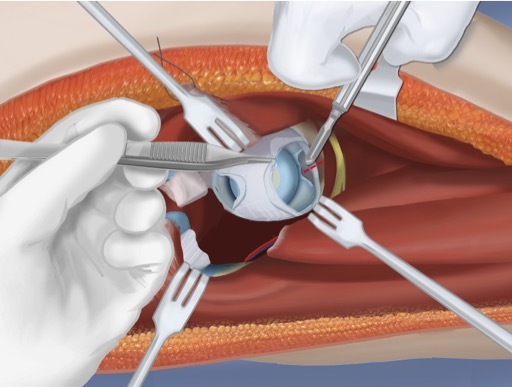 To start, the SUPERhip 2 utilizes the same incision points as the SUPERhip 1. It starts with the same muscle releases: tensor fascia lata, rectus femoris, the psoas, and the piriformis. 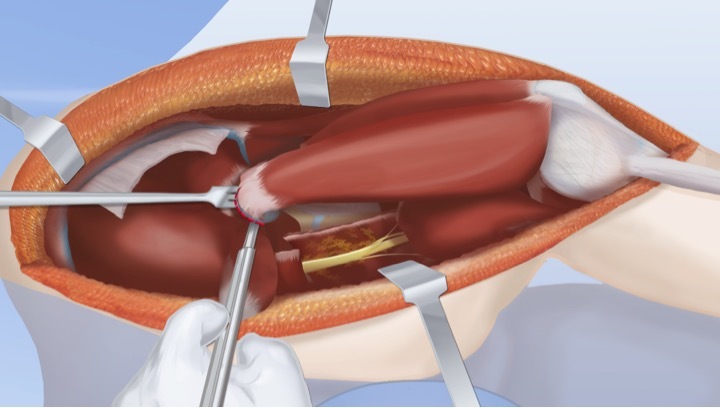 Next, the gluteus medius and quadriceps muscles are removed from the femur as a unit. This is done with releases near the greater trochanter. Release of the gluteus medius and quadriceps muscle exposes the hip capsule of the femoral head, which is carefully dissected. Next, Dr. Paley will physically test the mobility of the capsule by attempting to rotate it. If it is mobile, this indicates Type 2A CFD. If the femoral head is immobile or absent, this indicates Type 2B. If the femoral head is mobile (Type 2A) Dr. Paley will continue to dissect the capsule and will release the transverse acetabular ligament. 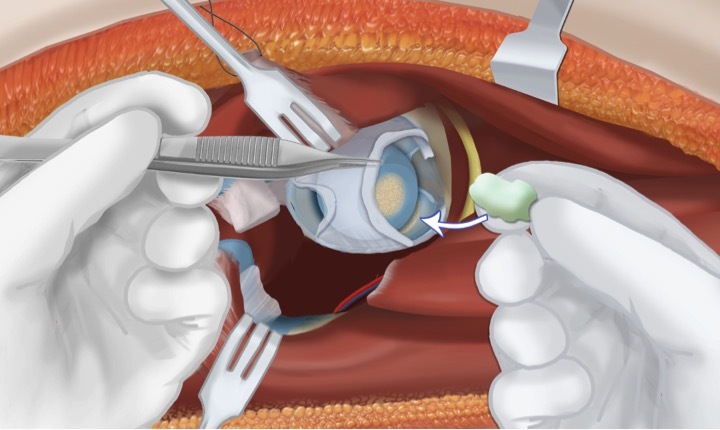 Dr. Paley will continue to dissect the capsule down to the ossific nucleus. A circular cut is made to the ossific nucleus turning the spherical surface flat. This prepares the site for later connection to the femur. 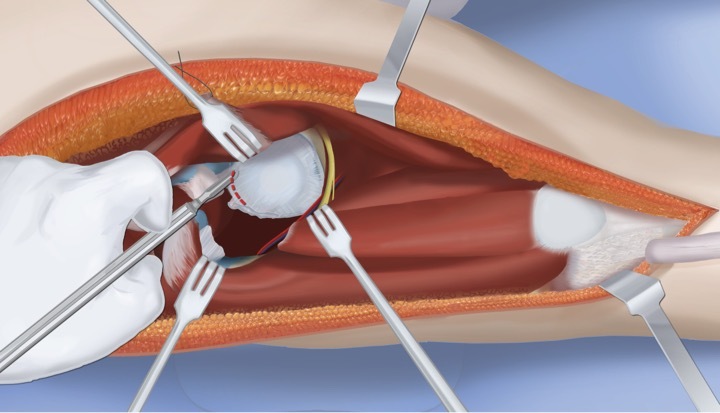 If the femoral head is fused and immobile (Type 2B), Dr. Paley will dissect the capsule and release the transverse acetabular ligament, as in Type 2A. Next, Dr. Paley will identify the fusion site of the femoral head and will release it. 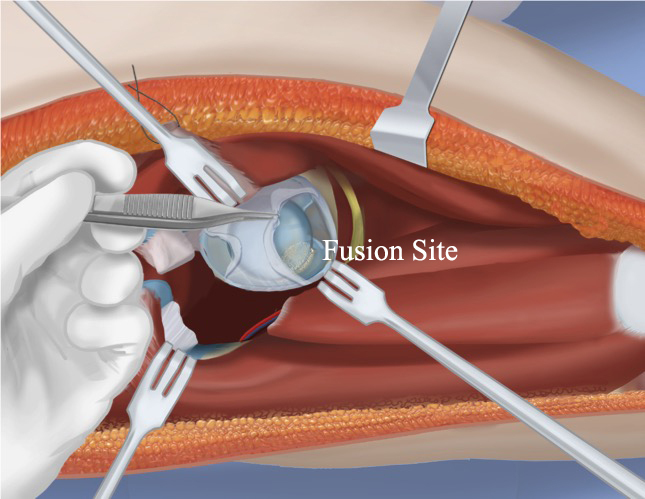 The femoral head is then rotated to expose the fusion site and bone wax is inserted to hold this arrangement in place. Now that the femoral head has been prepared, Dr. Paley will dissect the periosteum of the femur and perform the femoral osteotomy. The upper femur is cut twice to create a flat surface. The upper piece of the femur remains connected to the soft tissues. The upper piece of the femur is then rotated 135 degrees and aligned with the femoral head. This creates a new femoral neck with the proper alignment and orientation. 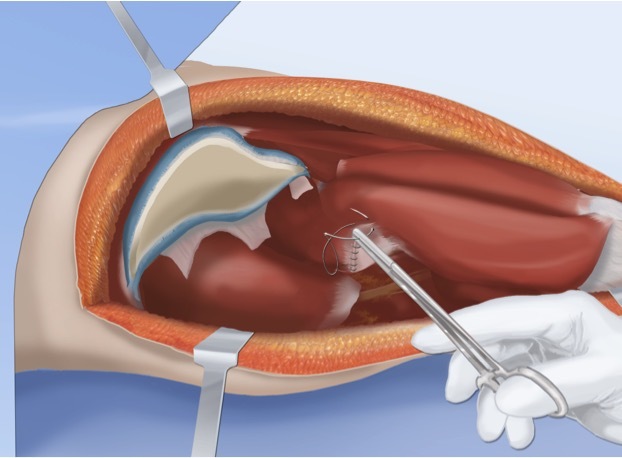 The upper piece of the femur is connected to the femoral head through a series of wires with threaded heads. 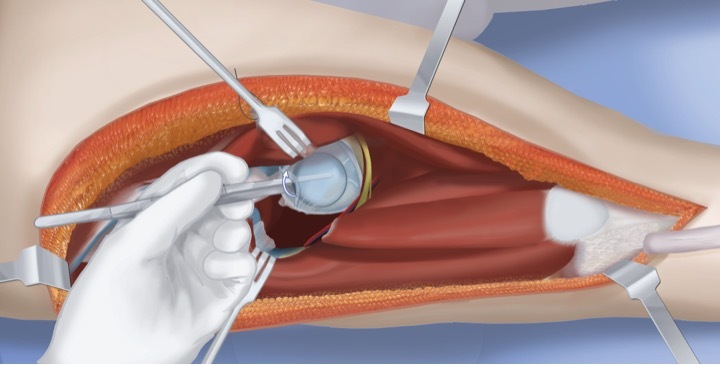 The new femoral neck is connected to the femoral shaft with a rush rod and a tension band wire wrapped around the rod. 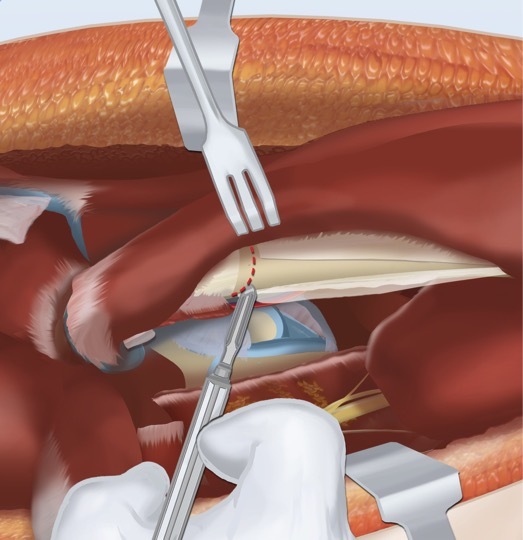 An additional screw is inserted to stabilize the femoral neck with the shaft of the femur. The next step is to reconnect the muscles. 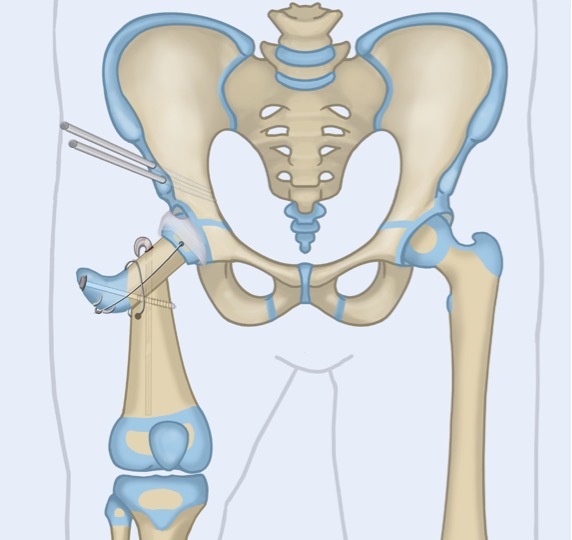 An abductor muscle slide is performed (as in the SUPERhip 1) and an osteotomy of the pelvis is performed to shorten the distance where the muscles must reconnect (as in SUPERhip 1). 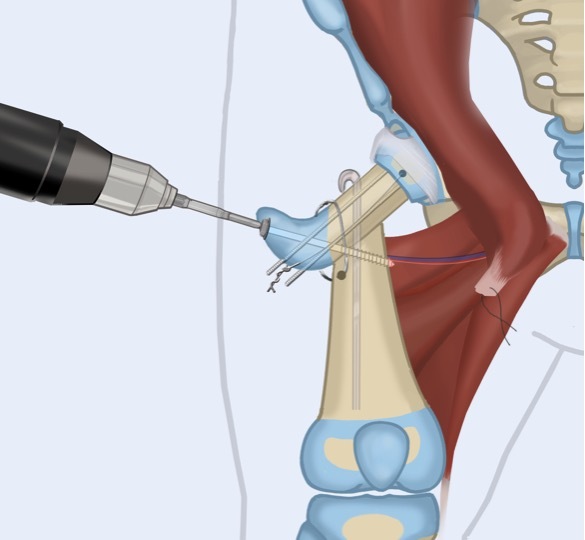 The abductor-quadriceps tendon unit is then sutured to the new greater trochanter. If the patient has a knee flexion deformity, Dr. Paley will also perform a posterior capsulotomy of the knee to correct the deformity. The final step is to apply the external fixator. A spica cast is not sufficient support to stabilize the new alignment after a SUPERhip 2. The external fixator is applied to the pelvis, the femur, and the tibia. 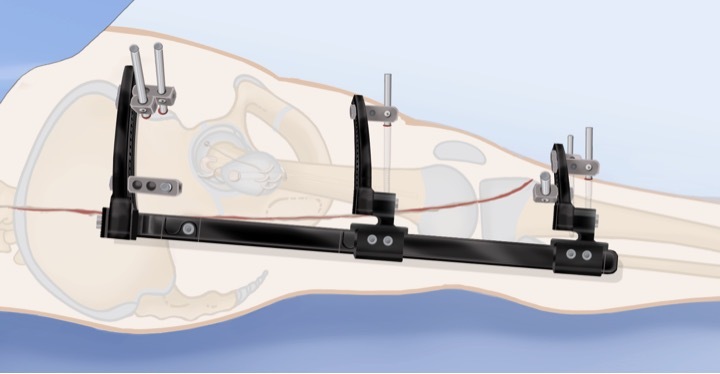 The benefit of the external fixator is that it allows the patient to walk (weight bearing as tolerated) during recovery. This completes the SUPERhip 2 procedure. 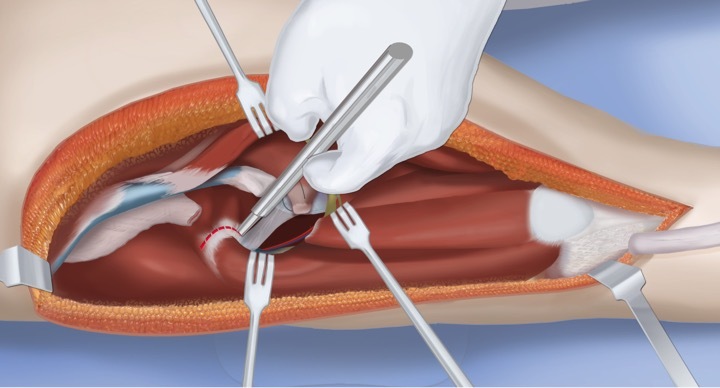 The patient now has a femoral neck and a femoral head that is mobile and connected to the hip joint. The patient is now ready for lengthening within the next one to two years.